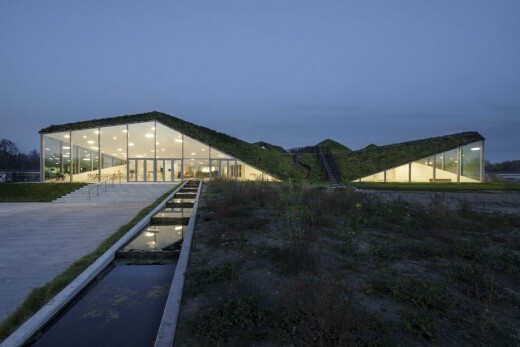 After an eight-month renovation, the Biesbosch Museum reopened to the public this summer. 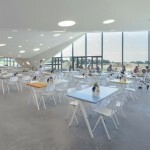 The museum has been completely transformed and extended with a new wing that opens to its beautiful surroundings and houses a restaurant and temporary exhibition space for contemporary art. The permanent exhibition that explains the historical development of the region has also been totally revamped. 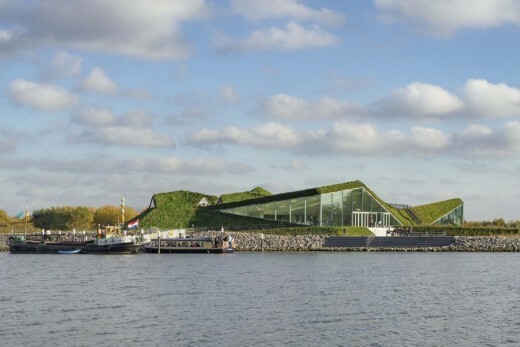 A large water model of the Biesbosch and a freshwater tidal park are also planned on the Museum Island. 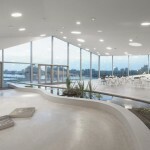 Building, interior, water model and freshwater tidal park were designed by Studio Marco Vermeulen, and the exhibition was designed by Studio Joyce Langezaal. 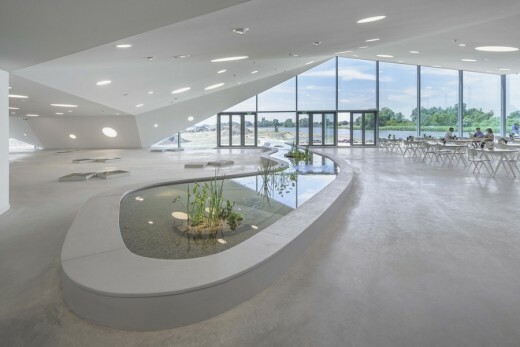 Water safety was the key reason for the development of the Biesbosch Museum Island. As part of a national water safety programme, the 4450-hectare Noordwaard polder has been turned into a water-retention area. 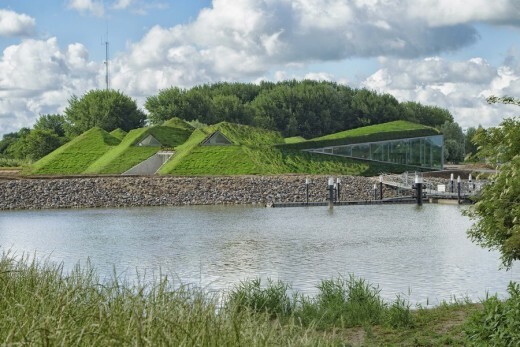 Outlets on either side of the Biesbosch Museum were dug to create a new island. 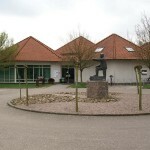 For most visitors, the Biesbosch Museum is the starting point for exploring the Biesbosch National Park. 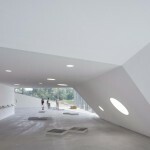 The museum, however, was outdated and not equipped to accommodate the growing visitor numbers. A lack of adequate catering facilities was particularly urgent. 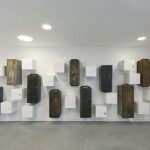 Moreover, the presentation of the collection needed an overhaul. In 2012, some 35,000 people visited the museum, while in the first three months since the reopening, no fewer than 30,000 people visited the complex! 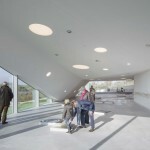 To avoid any unnecessary waste of material or energy, the hexagonal structure of the original Biesbosch Museum pavilions has been retained, and a new 1000 m2 wing was added on the south-western side of the building. 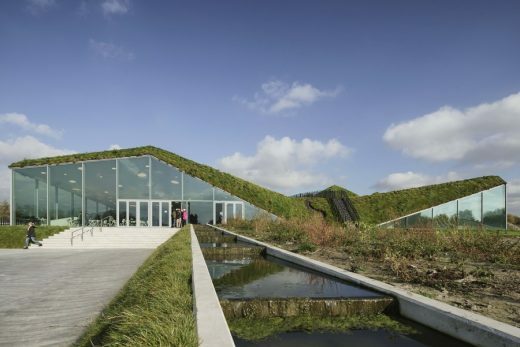 Featuring extensive areas of fenestration, the wing opens to the museum garden on the island. 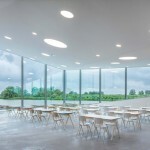 The extension houses an organic restaurant that offers views of the adjacent water and landscape, and space for temporary exhibitions. 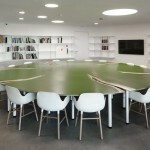 The existing building houses the permanent exhibition, library, multipurpose theatre, entrance area with reception and museum shop. 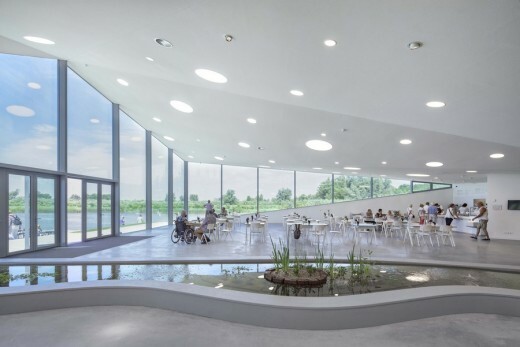 Visitors can obtain tourist information about the Biesbosch National Park and buy tickets for the museum and electric boats. 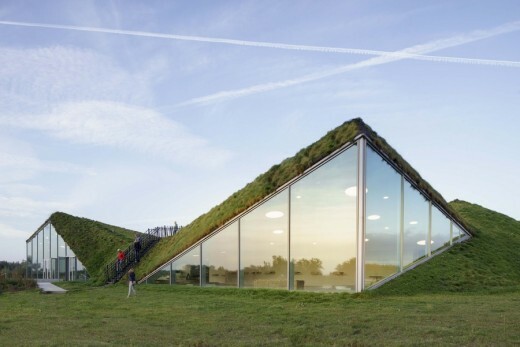 The addition of large dormers on the roof created space for the museum’s offices, the Dutch Forestry Commission and the Park Board. 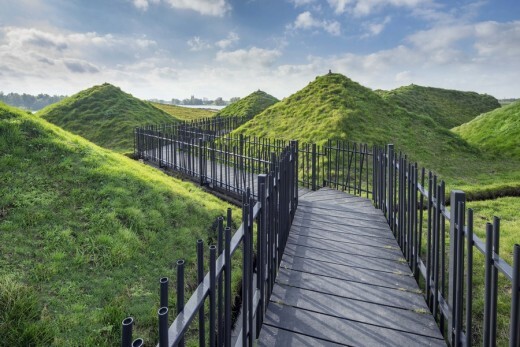 The old and new sections of the museum are surrounded by earthworks and covered with a roof of grass and herbs. 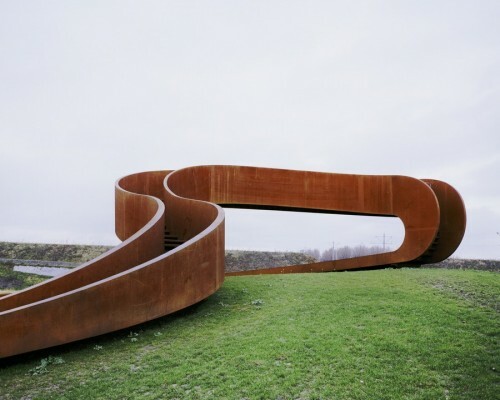 The roof adds ecological value, creating a sculptural object that reads as land art and, at the same time, manifests itself in the surrounding landscape. 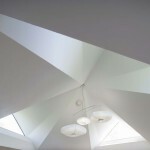 A fold in the roof gives way to an adventurous mountain trail and a lookout post. 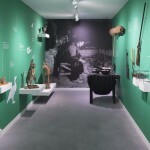 The new permanent exhibition offers a rich overview of the history of the Biesbosch, the culture and the collection of the museum. 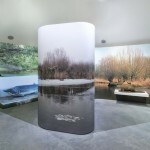 The unique story of the Biesbosch is displayed in seven pavilions, covering its history from the Elizabeth Flood of 1421 to its current status as a recreational area. 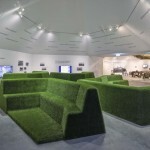 The residents, economy, crafts and nature are displayed in multimedia spaces that stimulate all senses. Original film material and photographs, interviews and tools present a personal and vivid account of the area and its residents. 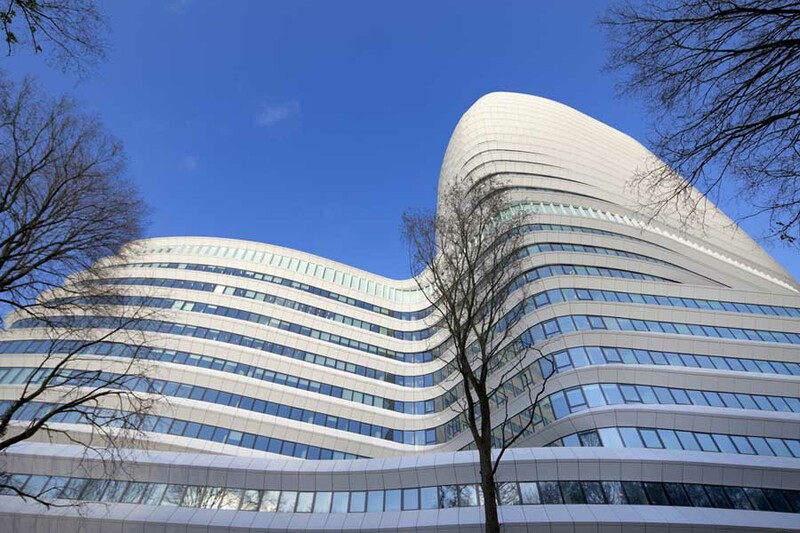 Both the new wing and existing volume are designed to minimize energy consumption. The glass front is fitted with state-of-the-art heat-resistant glass that eliminates the need for blinds. 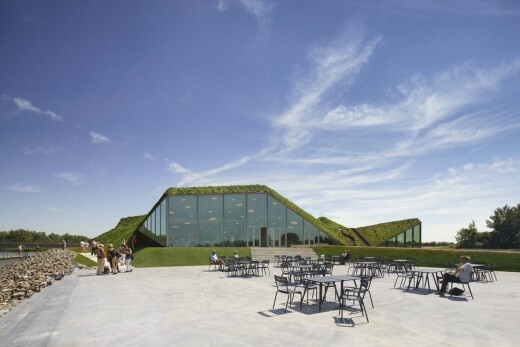 The earthworks on the north-western side and the green roof serve as additional insulation and a heat buffer. On cold days, a biomass stove maintains the building at the right temperature through floor heating. 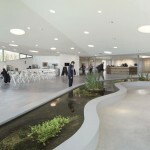 On warm days, water from the river flows through the same piping to cool the building. 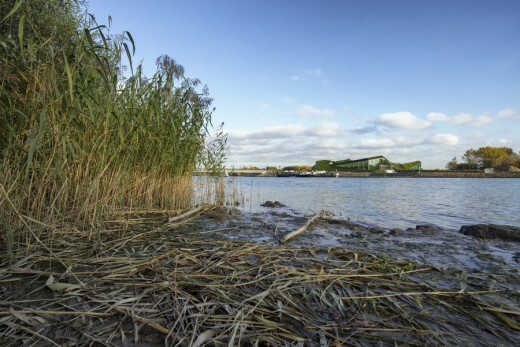 Sanitary wastewater is purified through a willow filter: the first in the Netherlands and an acknowledgement of the wicker culture of the Biesbosch. Willows absorb the wastewater and the substances it contains, among them nitrogen and phosphate. These substances act as nutrients and help the willow to grow. The purified water is discharged into the adjacent wetland area and flows from there into the river. Once the willows are sawn and dried, the wood can be used as fuel in the biomass stove in the museum or for other purposes. 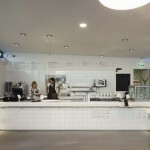 The museum uses many resources available in the area, not only for its energy supply and water treatment, but also for the menu in the microbrew restaurant. Moreover, the museum can count on the commitment of dozens of volunteers, many of whom have worked in the Biesbosch in the past. Even most of the contractors and construction workers involved in the redevelopment come from the immediate area. 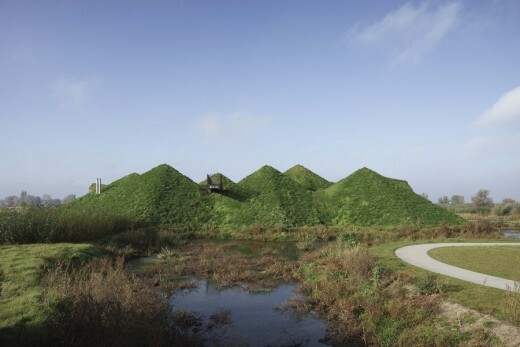 The Biesbosch has a rich history in harvesting and processing natural materials and is bio-based avant la lettre. 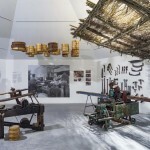 The museum therefore provides space for art, preferably made of natural materials from the Biesbosch itself, in the new wing and on the island. Midway through the last century, the impressive sturgeon and salmon disappeared from the waters of the Biesbosch. With the opening of the Haringvliet locks and the cleaner water in the river, the likelihood of a return of these distinctive species has increased. The indoor pond at the restaurant hints at the return of the sturgeon. 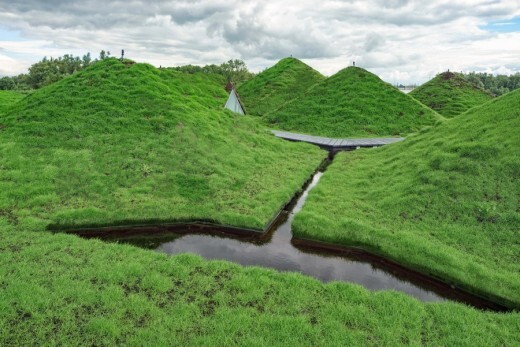 The Museum Island, which will be realized in the spring of 2016, is a freshwater tidal park on the island that receives river water through a newly dug creek. The tides and seasonal variations in water levels can be clearly experienced thanks to the gentle slope of the banks along the creek. The slopes also create a rich diversity of flora and fauna, so that every visit to the island will be different. 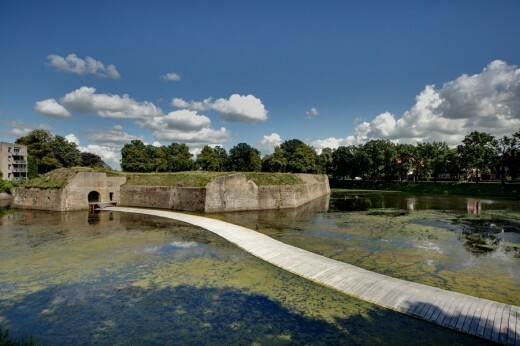 A meandering path provides access to the island, which continuously changes in appearance because of the changing water levels. 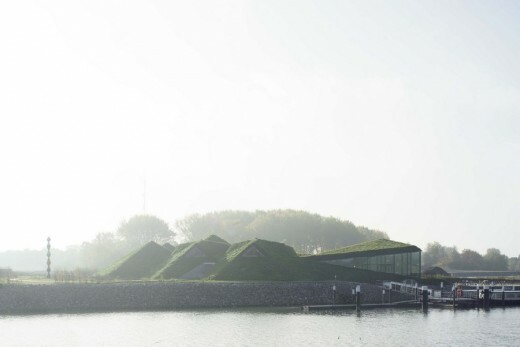 The ‘Biesbosch Experience’ will be realized on the Museum Island in the spring of 2016. This scale model of the Biesbosch, with polders, dikes and streams, explains the water management function and importance of the area when water levels are high. Within a half-hour cycle, the water changes from ‘extremely low’ to ‘extremely high’. Children and adults are able to alter the course of the water by operating various kinds of locks. 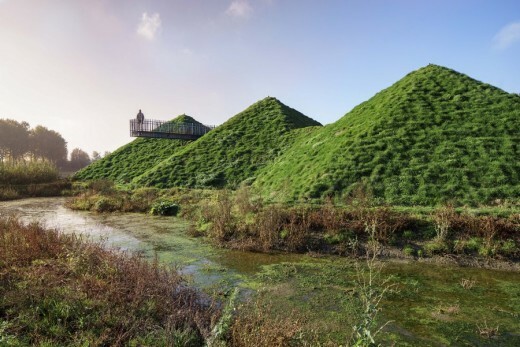 The open-air museum on the other side of the river features a wood of willows called a ‘griend’ where visitors can step back in time. 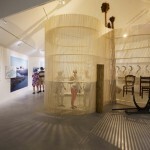 Visitors can also see a duck decoy, a hut made of willows and reeds, and a beaver lodge. 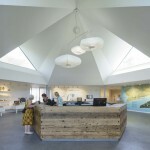 The renovation and extension of the Biesbosch Museum Island were completed with the support of: Province of Noord-Brabant, Dutch Forestry Commission, Department of Waterways/Noord-Brabant Water Board, municipality of Werkendam, VSBfonds, Stichting Dioraphte, Prins Bernhard Culture Fund, Stichting Hagedoorn, Vfonds, Stichting Hak, Jurriaanse Stichting, Van Cappellen Stichting, Ars Donandi, Stichting Van Zadel de Rooy, Gravin Van Bylandt Stichting.